Life in the city requires a constant chase against time. From long demanding hours at work to brief hours we spend relaxing with family and friends. This anxious chase, while it might boost productivity for some time, is not sustainable for the body of many people, like me. I find myself overwhelmed, whether it’s the crowding or noise, and I tend to regularly and physically isolate myself from my surroundings to meditate and slow my heart rate and eventually my anxiety down. StressBracelet is a biosensor that uses galvanic skin response to measure the stress or anxiety level and responds with the lighting of 12 LEDs when stress levels are high. The user of this device would wear the bracelet and go about their day as usual, if the LEDs switch on, or if the user can feel their anxiety rising, they can take a break and do some meditation which would lower the stress and that would lower the moisture in the skin, which in turn switches the LEDs off. The idea behind this bracelet is that since we, as city dwellers, are all prone to stress, there is a need for a device that silently communicates with us our level of stress is high, and if needed, that we should take a few minutes to breathe and take control of it. 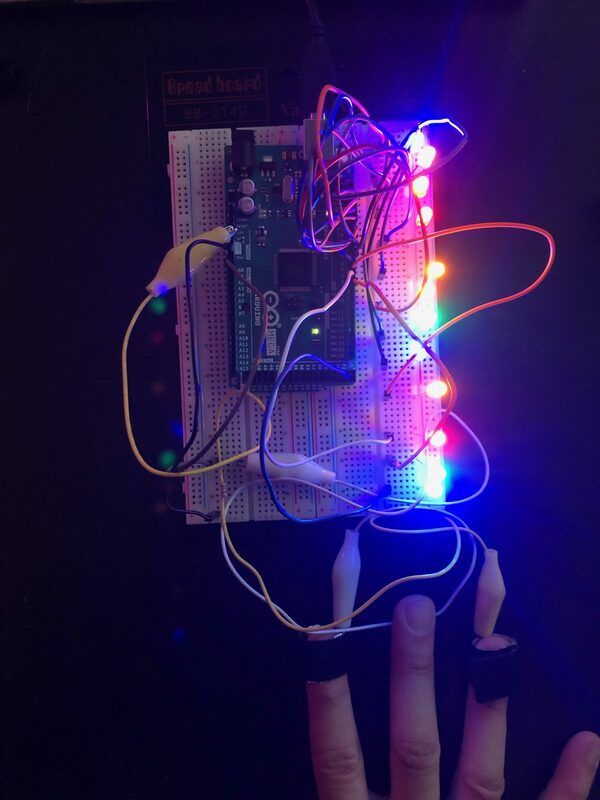 Using colourful LEDs added a positive spin to this device, on one hand, the user might be experiencing anxiety, but on the other hand, they will also see a colourful mixture of light, which is a less stressful approach to interact. The aim of this experiment is to propose a tool that would help people get rid of their anxiety in public spaces and especially on their commute. The sensor has to be easily portable and accessible on-the-go, while at the same time discrete and personal in its interaction. The reason I decided to create this sensor in a bracelet is because it is important for this device to be handsfree for people to use while they are walking or commuting. I am also interested in bringing to the table the concept of electronic components as a wearable statement that speaks to a digital generation. So, starting from this logic, I began to think of how a bracelet like this might look. Chain bracelets are some of the most popular bracelets used worldwide, whether made of silver or gold, chain designs have been the dominant style for bracelets for a long time. So, building on that, I decided to experiment with the idea of chaining LEDs create a chain that is then connected to a controller, which then adds a certain functionality of the chain. However, I quickly realized how difficult it, because of the number of wires required to connect the LEDs to the 5V and the ground. So, I decided to tweak my idea and create a different iteration of the bracelet with the LEDs attached to it, rather than hanging from it. For the finger sensor, I decided to use aluminum foil attached to velcro and wrapped around two fingers, index and middle fingers. Although the foil is sufficient for this experiment, it is extremely fragile and cannot be constantly re-used. However, through experimenting with the sensor, I recorded the serial readings and noticed that they were extremely unstable, but I was able to get an idea of the range, between 0 and 13 in a normal state, and 15-28 when activated. The experiment I made used meditation as a way to push moisture in the hands (from sweating due to stress) down and blowing hot air into them to activate the sweat glands and record higher readings. Through moisture in the hands, the voltage on the serial print through the Arduino is either increase (with more moisture) or decreases (with less moisture). This allows us to record those readings and measure to some extent the amount of stress a person is going through. To build the circuit I followed a similar approach like the one we covered in our last experiment. 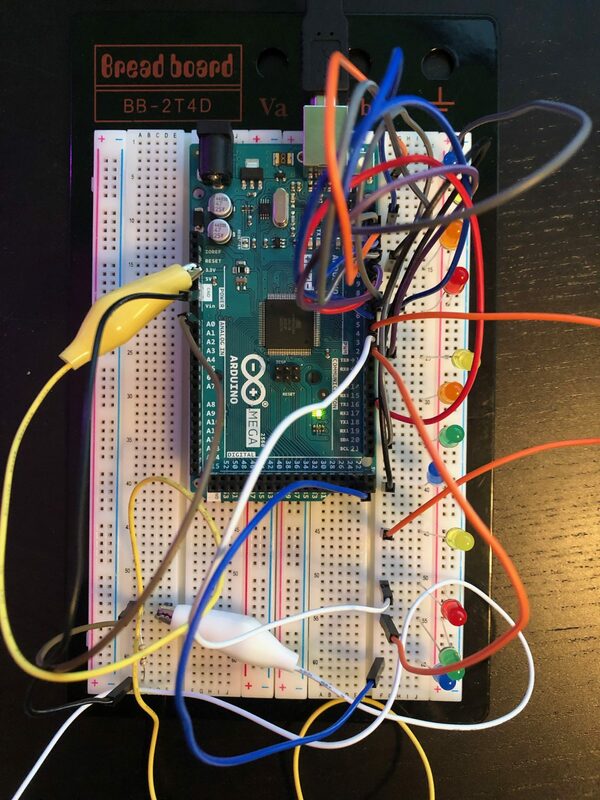 Connecting one of the sensors to a transistor that is also sending the sensor value to the A0 pin, and the other to the 5V pin on the Arduino. Also, linking the LEDs to digital pins on the Arduino and the ground to the ground. 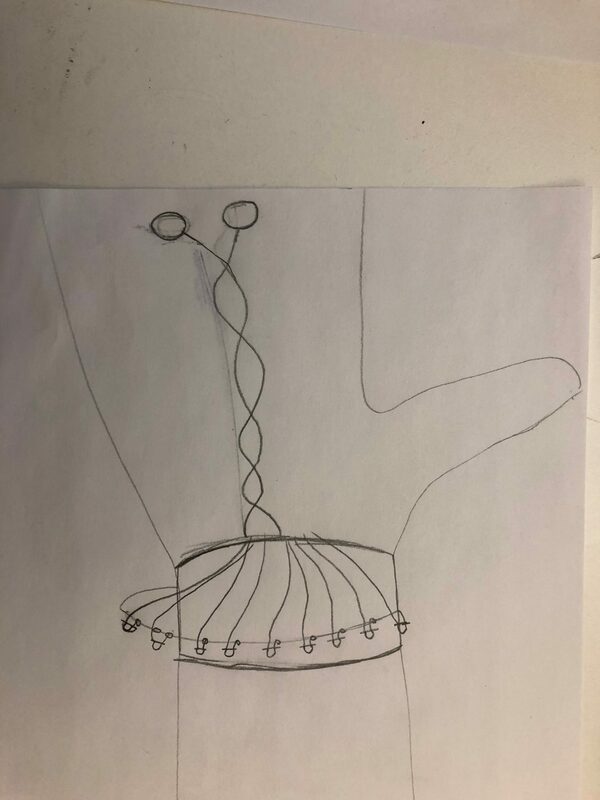 This circuit allows the Arduino to read the amount of voltage that passes through the human skin, which increases when the sweat glands are activated through stress, anxiety, working out, etc. Once all the parts were assembled, I moved to the Arduino code. 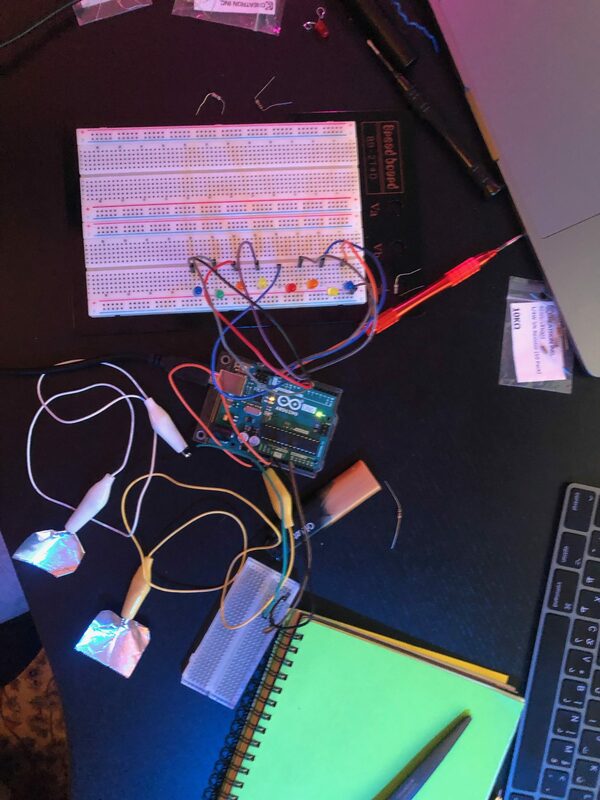 I started off from the provided code in the class presentation slides, which only gave us the ability to control one LED. So, I decided to add 11 more LEDs in order to achieve a sort of ambient effect as a result of the rise in the stress level. 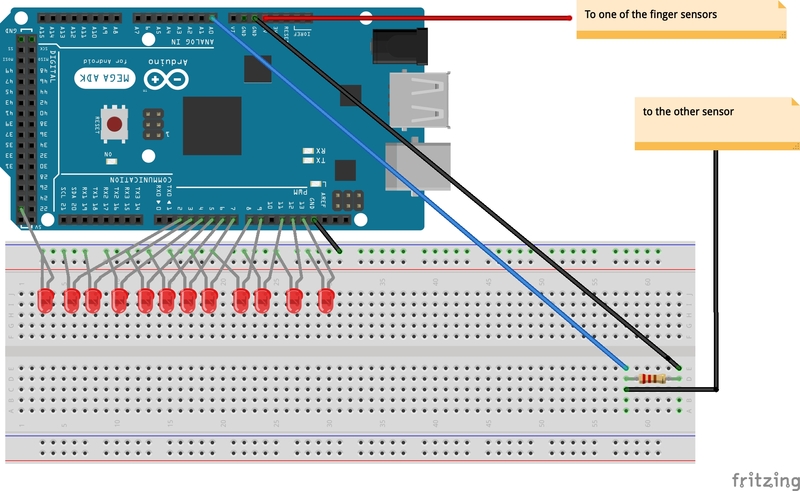 In the code, I assigned pins 13 to 2 (with the exception of 10 and 23) as LED pins and connected the positive side of the LEDs to the digital pins on the Arduino. Also, I knew I had to add the “digital.write” line of code for the 11 new LEDs . 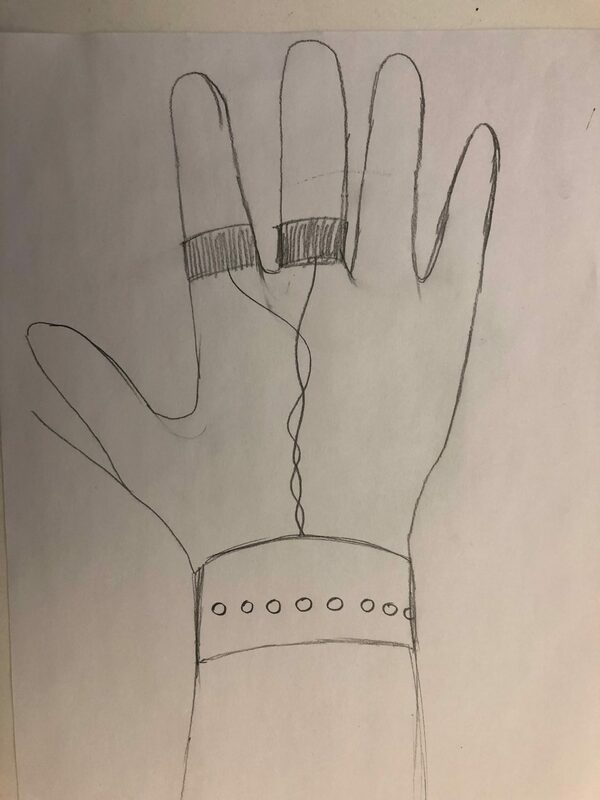 The biggest challenge I faced during this experiment was figuring out how to make all the components fit into a wearable device. One of the problems is I only own an Arduino Uno and Arduino Mega, and both are way too large to be considered for wearables. However, having a smaller controller will make this task a lot easier. 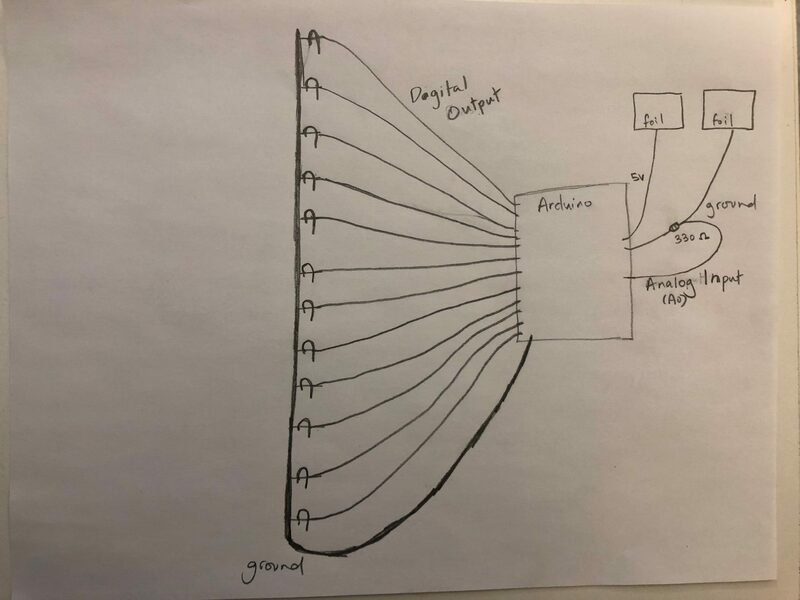 Also, my original idea of connecting the LEDs and the components in a chain link turned out to be much more complex than anticipated, which led me to change my design drastically. I am considering other options of how to put this device together for a wearable experience. During my research into different ways to make this device, I noticed that some people were able to build something very similar without the use of a controller. I am very interested in pursuing that option further and seeing where that would lead. For this experiment, I used parts from my own collection, however, for my next iteration, I plan to purchase a few parts in order to tweak the device even more. Learning how to build a biosensor opens up many doors for future explorations into this subject. We can build and customize our sensors to match our bodies.